In this 8 week project youth were exposed to murals and the mural making process. In the first workshop participants explored the history of mural making and the relevance of murals today. They worked together to develop a theme that was meaningful to them and the placement in The Next Generation Teen Center. We found that what we all had most in common were the challenges we face daily and our means to overcome and break free from them. Once the theme was finalized, participants learned and experienced the four stages in mural making: research, design, presentation, and fabrication. 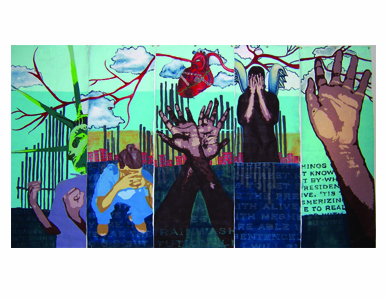 In support of growing efforts to improve the service and court user experience in Family Court, Artistic Noise partnered with the Bronx Family Court to enrich the Family Court's public areas and courtrooms with visual art created by youth with firsthand experience of the court's juvenile justice system. These banners were created as a part of this project. The youth involved in Artistic Noise's Art, Entrepreneurship and Curatorial Program, all of whom have spent a lot of time at the Bronx Family Court, began this multi year project by leading a brainstorm session with judges and other staff at The Bronx Family Court. Through this meeting the youth, judges and court staff spoke about the messages, themes and content they would like to see in the artwork created for Family Court. The notes from these meetings were used throughout all of the Artistic Noise programs working on this project. These painted canvas banners are loosely based on the Tibetan tradition of prayer flags. The themes derive from the youth's artistic interpretation of waiting and sitting, the judges desired messages, and the concept of passing time peacefully. Inspired by Street Art and Surrealist aesthetics, Artistic Noise youth created a series of murals for the IAC Corporate Headquarters in Chelsea. Decorating the entrances of 6 floors in this Frank Gehry designed office building, participants carefully planned and executed inventive, thoughtful, and playful works. Using collage as a starting point for our mural designs, our youth considered how the meaning of printed media images could change if they were altered to share a different perspective. This imaginative investigation was motivated by our desire to build a connection with the youthful media based companies of IAC, such as Vimeo and Newsweek Magazine. Throughout the months of February and March, we worked to make our sketches happen, and are very proud of the results! 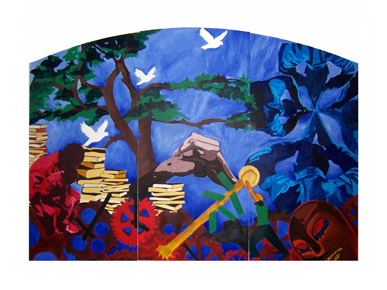 In support of growing efforts to improve the service and court user experience in Family Court, Artistic Noise partnered with the Bronx Family Court to enrich the Family Court's public areas and courtrooms with visual art created by youth with firsthand experience of the court's juvenile justice system. This altered book was created as a part of this project. 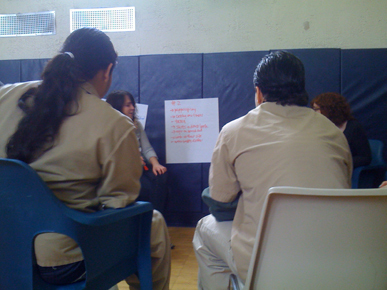 The youth involved in Artistic Noise's Art Therapy program, all of whom have spent a lot of time at the Bronx Family Court, took the main text used in New York State's Family Courts, Family Law: Family Court Act, and through an in depth artistic process altered the book to create "It's My Law". "It's My Law" comes entirely from the probation section of Family Law, because all the youth who contributed are on probation. Within the pages of Family Law, are the words, sentences and paragraphs, that directly affect the youth's lives. To create this altered book, the youth were given blown-up pages of the original text and told to alter the pages using the text in any way they desired. The result of the process is powerful, with diverse approaches and styles. The Art Therapist, Yasmine Awais, and the Teaching Artist, Alfred Planco, who co-led the project, had expectations put through the paper shredder, as the works are complex, mature, and with purpose. Each page conveys a belief, makes a statement, explores. The concept for the cover was designed by the youth and made by Alfred Planco. It's the same style as the original book's cover. All of the artwork in this book uses the original text, with no extra words added. The pages from the probation section of 'Family Court Law' that were not incorporated into this book, were used by the youth in a follow up project where they treated the stack of pages as an object and transformed it into a work of art. In support of growing efforts to improve the service and court user experience in Family Court, Artistic Noise is partnering with the Bronx Family Court to enrich the Family Court's public areas and courtrooms with visual art created by youth with firsthand experience of the court's juvenile justice system. 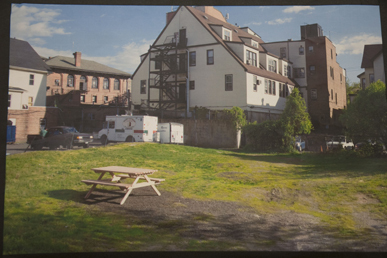 These large scale prints were created as a part of this project. The youth involved in Artistic Noise's Art, Entrepreneurship & Curatorial Program, all of whom have spent a lot of time at the Bronx Family Court, began this year long project by leading a brainstorm session with judges and other staff at The Bronx Family Court. Through this meeting the youth, judges and court staff spoke about the messages, themes and content they would like to see in the artwork created for Family Court. The notes from these meetings were used throughout all of the Artistic Noise programs working on this project and inspired these large-scale prints. The youth designed, hand carved and hand printed these 6' x 3' woodcuts. We hope to print these woodcuts using a steamroller during a community day at Bronx Family Court this year. 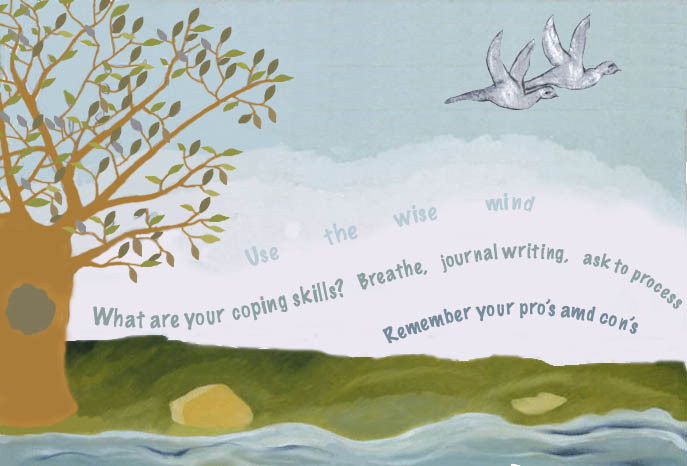 In the fall of 2012, the girls at Spectrum Detention worked together to transform one of the rooms on the detention unit into a peaceful haven that features an image of a calming landscape. After weeks of sketching, color mixing, painting, and final touch-ups, the girls at Spectrum finished a beautiful mural that decorates a room on the detention unit. Thank you to the Spectrum detention staff for setting aside a space and helping to make this project happen! The mural brightens the space and gave the girls an opportunity to shape their living space in detention. It was also a great collaborative experience that required teamwork and cooperation! In Spring of 2011, the Bronx Residential Center collaborated with Purchase College, SUNY to implement the Ghana ThinkTank Process in Port Chester, NY. Residents at the Bronx Residential Center served as a Think Tank for Port Chester problems, and then helped make their ideas come true. Pictured here is the park bench they built with SUNY Purchase students to install in unused green spaces around New York City and Westchester. Creative Arts Workshops for Kids (CAW), a Harlem-based arts non-profit organization secured a space for a public art project in the Manhattan Family Court. 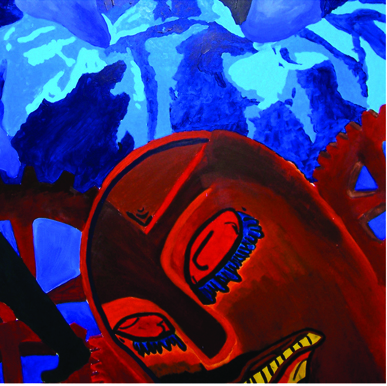 The project grasped the unique potential of embracing a restorative justice model and asked Artistic Noise and our court-involved youth to create the artwork. All of our youth have themselves spent time in the courthouse and waiting room and the opportunity to involve them in the creation of artwork for it was particularly meaningful. Artistic Noise, along with our partners, The Creative Arts Workshop for Kids and The Children's Aid Society's LINC Program hosted an unveiling/ dedication for the Family Court project at The Lower Manhattan Family Court 4th Floor Waiting room on June 30, 2010. It was a huge success with the dedication of the 8 large-scale banners that are permanently installed. Four teen artists read their artist statements to a packed waiting room with judges, officers, court employees and the press. The painted canvas banners and handprinted linocut borders are loosely based on the Tibetan tradition of prayer flags. The themes derive from the youth's artistic interpretation of waiting and sitting, and methods for passing time peacefully. Throughout the year the young artists involved in this project studied the history of mural painting up until the present day. This research culminated in the residents being able to leave the facility for a day to go on a fieldtrip to the Museum of Modern Art. While there they studied Jose Clemente Orozco's famous fresco, Dive Bomb and Tanker as well as other contemporary works. Through critical discussions and activities the young artists chose a theme for their mural, keeping in mind it’s permanent installation in the entryway of the facility. The final design is a combination of elements of many of the young artists’ individual works. 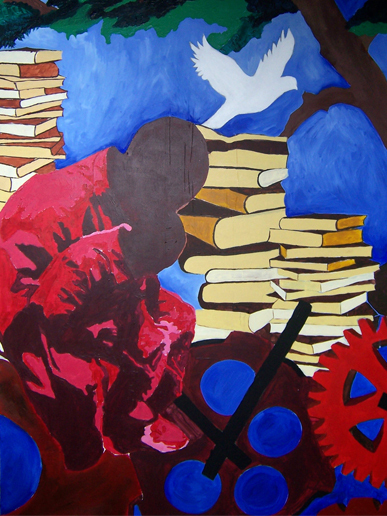 Themes such as struggle, freedom, the passage of time and the road to success were explored. 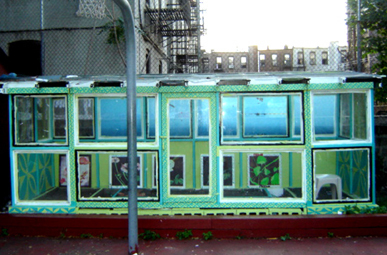 This project was completed prior to the creation of Artistic Noise in NY. As a result of the success of this project and others like it though, Artistic Noise expanded into NY. These early projects were instrumental to the formation of our NY branch. This project was created during a six-week summer arts program for girls detained at the Brooklyn Residential Center in the Crown Heights section of Brooklyn. Working with a group of 8 girls we renovated and transformed a dilapidated greenhouse in the courtyard of the residential center. The project focused on the theme transformation. The girls began looking at personal issues they would like to transform and then extended this to examine societal issues that needed to be transformed and reconstructed. In addition to transforming a communal space, the girls also chose to decorate the “greenhouse” with flowers and plants that have symbolic references to personal transformations. For example, one student chose to paint a cedar branch, which stands for strength. The “greenhouse” was also decorated with a pattern inspired from an African mural book that girls viewed in class. This project was completed prior to the creation of Artistic Noise in NY. As a result of the success of this project and others like it though, Artistic Noise expanded into NY. These early projects were instrumental to the formation of our NY branch. As part of our Masters Thesis Lauren Adelman and Danielle McDonald collaborated to teach an art class at a secure residential facility for adolescent girls in Brooklyn, New York. In this class, we came together to discuss issues of identity and to explore art as a vehicle for sharing one’s personal stories, and how these stories can raise awareness to the lived experiences of incarcerated young women. This project began by viewing a digital slide show of contemporary artists who create socially engaged work in the public sphere. In response to the conversations around this slide show, the girls chose to paint large-scale banners, sharing stories about themselves, as their public artwork. In preparation for this project, the girls created identity collages incorporating digital photography and also painted self-portraits. Through questionnaires, hip hop music, imagery from popular culture, contemporary art, quotes and statistics critical conversations were sparked. The participants completed five banners, 3 x 8’ tall which were showcased in a NYU sponsored exhibition in a downtown Manhattan space. 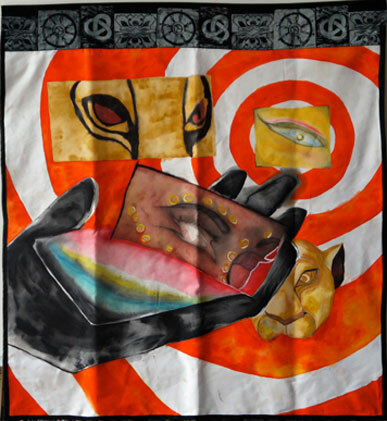 The banners incorporated images that represented who the young women are individually and collectively as young women involved in the New York juvenile justice system. The artists wished to show themselves in their different environments past, present and future. The banners juxtapose their struggles within the system and the goals they have set for themselves as they leave, incorporating their dreams for the future. This project was completed prior to the creation of Artistic Noise in NY. As a result of the success of this project and others like it though, Artistic Noise expanded into NY. These early projects were instrumental to the formation of our NY branch. These postcards were created for "Art and Social Activsim: A Visual Research Project". 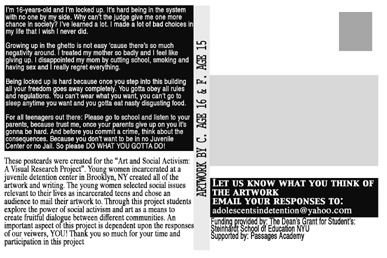 Young women incarcerated at a juvenile detention center in Brooklyn, NY created all of the artwork and writing. The young women selected social issues relevant to their lives as incarcerated teens and chose an audience to mail their artwork to. Through this project students explored the power of social activism and art as a means to create fruitful dialogue between different communities. 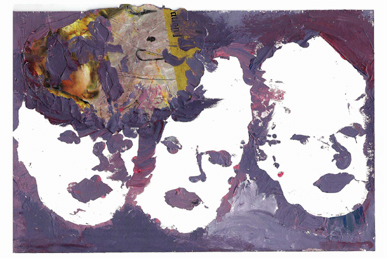 The audience was encouraged to respond to the artwork.